Curacao Triple sec 40% Alc. Curacao Triple sec 25% Alc. It all started in the 80s with Thomas Anton, owner of Vinhuset Norden. His team dreamt of a perfect and pure Danish Vodka – unique and traditionally Danish in content and design.This revolutionary Vodka includes clearness, quality and preciousness and be ideal for traveling and chilling. So the idea of a non-glass bottle was born and constructed from the perfect material, aluminium. Thomas Anton and his team created DANZKA Vodka in the seamless standard of Scandinavian design and the success story began . You practically want to spread DANZKA Currant on your toast, it is so reminiscent. 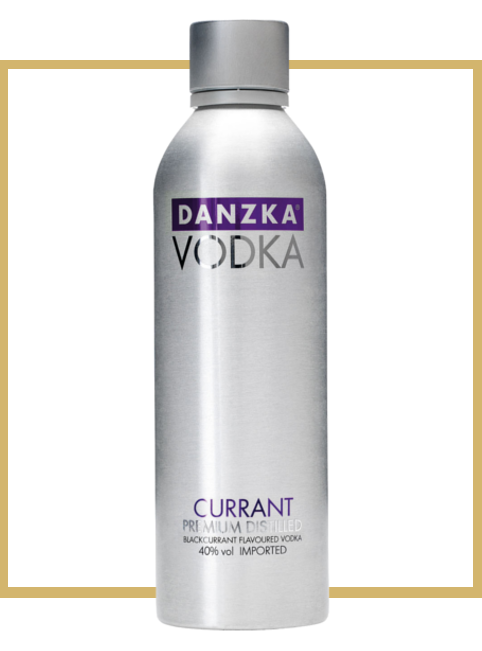 Lovely, rounded and luscious, DANZKA Currant is perfect in cocktails and highballs, but it particularly shines with lemonade: Serve it tall, packed with ice with a wedge of lemon and some red currants or have it in a warming mulled wine for these long winter evenings. Color Clear, glossy & clean with good lingering tears. Nose The nose is explosive, and reminds the drinker of the comfortable aroma of home-made currant jelly, both sweet & tangy. This character is sustained throughout the drinking experience, but leads way to a slight pepperiness and suggestions of vanilla. Taste The palate, on the other hand, isn't as sweet as suggested by the initial nosing; but rather opens up with a slightly dry character of dried cranberries & black currants, but then leads way to another superb burst of red currants sweetness. Finish In spite of this sustained, homemade currant jelly character; DANZKA Currant concludes with a mildly spicy finish. © 2016 Fortier Wines & Spirits. All Rights Reserved.